Edenhope, a rural township, is on the Wimmera Highway between Horsham and Naracoorte. It is 30 km east of the South Australian border. 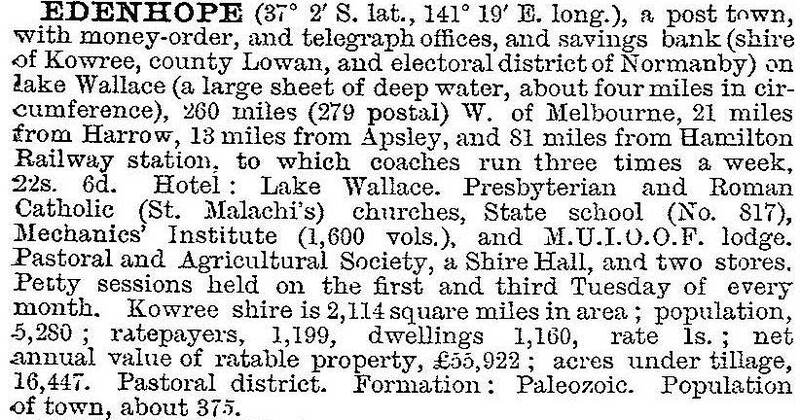 Notwithstanding Edenhope’s distance from Melbourne, it is relatively close to the early settlements of Harrow and Naracoorte. It is in the area occupied by the Lake Wallace pastoral run (1845), and a township was surveyed in 1862. A school was opened in 1865. There were also a hotel and a coach service from Edenhope to Hamilton. The name was given by the surveyor, and the source of the name was probably the family name of George and James Hope who acquired the Lake Wallace pastoral run. During the 1860s Edenhope was recorded as having three stores and Anglican, Catholic and Presbyterian churches – or perhaps preaching places – and an agricultural and pastoral society. A mechanics’ institute was opened in 1882, and the town was sufficiently advanced for the administrative centre of the Kowree shire to be moved there from Harrow in about 1887. In 1866 the Edenhope cricket club recruited Thomas Wills who had played for the Rugby School football and cricket teams in England, cricket for Marylebone and for the Victorian cricket team. He became a coach of an Aboriginal cricket team which was the first Australian team to tour England, in 1868. The team’s famous batsman, Johnny Mullagh, is buried at Harrow, and there is a memorial to the cricket team in the grounds of the Edenhope secondary college, beside Lake Wallace, where Wills coached the team. Edenhope has developed mainly as a wool grazing area. Several large properties have been subdivided for smaller family farms, particularly for soldier settlement after World War II. The town’s population reached nearly 1000, compared with about 450 in the 1930s. The school was raised to higher elementary standard in 1946 and a high school began in 1959. The year before, the town began its annual Henley on Lake Wallace boat regatta. Edenhope has a district memorial hospital, elderly persons’ facilities, a racecourse, a golf course, boating and fishing facilities in Lake Wallace, and tennis, swimming and bowling facilities. As well as the State combined primary and secondary schools (217 pupils, 2014) there is a Catholic primary school (1953). There are Anglican, Catholic, Lutheran and Uniting churches. The lake has foreshore parkland and there is a reserve adjoining the showground; the racecourse is west of the town, near the aerodrome. Edenhope’s tourism and information centre is in a former court house, and the town has a hotel, a motel and a caravan park. The West Wimmera Advocate is published in Edenhope and West Wimmera shire, the successor to Kowree shire, is headquartered there.